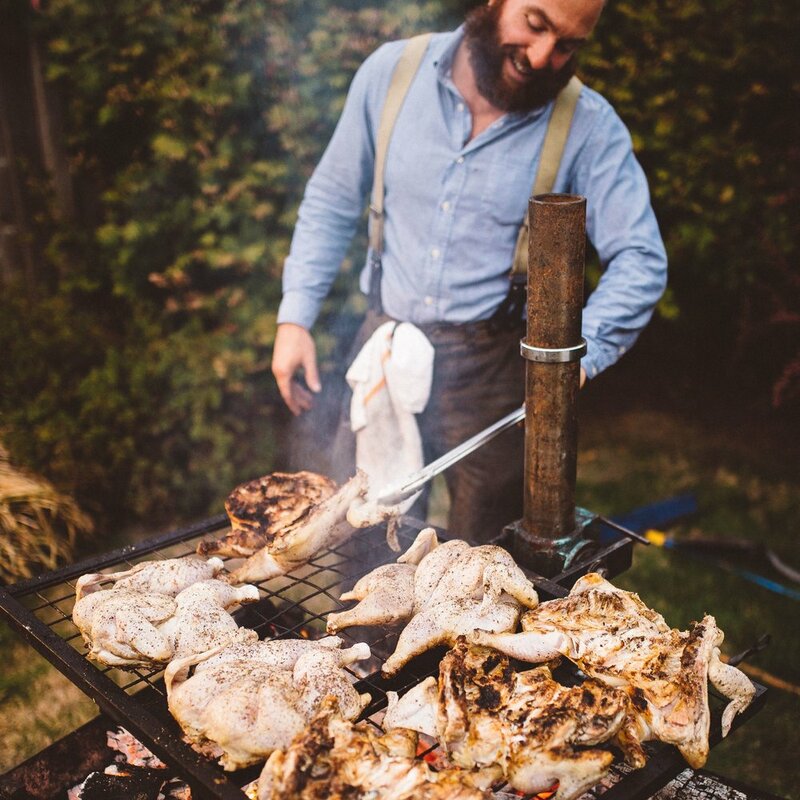 We are excited to feature chef, butcher, forager, and farmer; Karl Holl of Spatzle and Speck. Karl Holl’s style and philosophy of cooking are intricately tied to the land. Along with his farmer brother, Alex Holl, Karl grows and raises the majority of what he cooks, with menus driven by the seasons and what his farm produces. Continuing the sibling power duos, it is our pleasure to feature the Shook Twins Trio. Identical twins Katelyn Shook, and Laurie Shook are joined by Niko Daoussis, in this paired down acoustic version of their full band. Join us on August 25th as we head to Witte Flower Farm for the first overnight Serenade! From afternoon cocktails all the way to breakfast, spend the weekend with us as we serenade all of your senses. Saturday afternoon will begin with cocktails, flower crowns and a tour of Witte Flower Farm. We will move into appetizers and more beverages before gathering for a multi-course feast from Proletariat Butchery and Food Art Love. Feasting will be followed by a live performance by Cascade Crescendo into a bonfire and camping. Then, enjoy waking up on Sunday morning amongst the gorgeous flower fields for a picnic breakfast. Join us for a vibrantly beautiful Serenade held in the lush fields of Vibrant Valley Farm. We are so excited to feature Chef Shauna Galante of Secret Language. This feast will celebrate the bounty of summer produce at its peak and feature many items grown right at Vibrant Valley Farm. Enjoy multiple courses of thoughtful dishes prepared lovingly and with the intention of total body happiness. This delicate and thoughtful feast requires a unique musical pairing. Enter Hollis Peach. Comprised of Jacquie Aubert and Danny Sherrill, this duo creates a finely nuanced musical pairing. Hollis Peach weaves evocative, mischievous and deeply personal stories in the American vernacular of song and story. Though deceptively simple, their musical arrangements and harmonies are lush, intricate, and often hypnotic in their elegance. When all is said and done, Hollis Peach's music is a powerhouse of subtle gestures and graceful storytelling. Join us in San Francisco for a truly locally sourced Bay Area Serenade. From the chef to the band, to the produce and beverages everything comes from within a 75-mile radius of San Francisco. A Portland native, Moorea Masa was raised in the musical mecca of the city. The daughter of an Italian immigrant father and an African-American mother born abroad, this singer/songwriter/guitarist has been making music for as long as she can remember. Shine A Light, comes from the depths of a sometimes-troubled childhood and expresses a belief that the unexamined life is not worth living. Drawing inspiration from Moorea’s Italian roots, Tournant is crafting a feast to match the soulful mood of the night. Centered around Northern Italian cuisine, Tournant’s menu will showcase classic Italian dishes with a Pacific Northwest spin. Sultry songs and a decadent communal feast to serenade your senses! Winter months in Portland may be dark, but there is light to be found within the community. Join us as we collaborate with the talented Risa Lichtman to bring some warmth and light into our lives. Using a wood-fired oven she will be infusing this feast with warmth and a depth of flavor. Accompanying this feast will be the sweet sounds of The Riverside Folk. Join us in the golden city by the bay for Serenade’s first California event. Serenade is bringing a taste of Portland to San Francisco in the form of the talented chef Risa Lichtman. After many years of cooking and living in the bay, Risa moved north to Portland. She is passionate about ingredient-driven food and working with local farmers which reflects in the quality of her food. For this return to her beloved city, Risa is preparing a golden feast. Enjoy three courses artfully crafted around the color gold and paired with the Rainbow Girls. Sweater season may be in the air, but we are keeping it toasty at Serenade. Join us as we reunite with two of our favorite chefs, Mona and Jaret of Tournant, for a feast to remember! We'll be blending warm Morrocan flavors with Pacific Northwest influences to create a culinary experience centered around a delicious lamb Tagine. Tagine is a term used to both describe a North African stew and the cone shaped pot it is cooked in. This flavorful dish made with meat, vegetables and flavorful spices will warm you from the inside out. Join us as we celebrate summer’s warm, fresh bounty before diving into fall’s crisp flavors. We are excited to collaborate with Zeph Shepard of Proletariat Butchery! Proletariat will be grilling our main course over a live fire, and you are encouraged to lend a hand. Grilled goodies will be accompanied by a delicious array of summer fruits and vegetables prepared by Serenade. Feast outdoors on this fireside meal while sipping on local beverages. The night’s featured musical guest is The Last Revel. This powerfully talented trio of multi-instrumentalists from Minneapolis, Minnesota naturally blends the genres of Folk, Rockabilly, Old Time String Band and Rock to create a sound that is as original as it is timeless. The Last Revel consistently delivers “Bombastic live performances", as well as delicate and haunting folk ballads. Bask in the bounty of summer with a quintessentially Southern staple! Kaela and Austin of Serenade are taking the Southern classic, Low Country Boil, and giving it a Pacific Northwest spin! Feast on heaping piles of shrimp, kielbasa, corn, artichokes and potatoes dunked in garlic thyme butter. Everything tastes better outdoors, especially when you can eat with your hands! Portland's own Ben Larsen showcases his instrumental prowess with the debut of his new project, the Ben Larsen Trio. Featuring Julio Appling on upright bass and Leif Kalstrom on the five string violin, this three piece puts a new spin on modern acoustic music. Enjoy this feast for your senses as day turns into a warm, star strewn night. Join us as we head south to Brazil! Blending Pacific Northwest flavors with the fiery flavors of South America, Tournant pays homage to the traditions of Brazil, featuring Feijoada Brasileira. This hearty pork dish is quintessential Brazilian comfort food and comes paired with a myriad of delicious sides and toppings. Sink your teeth into this mouthwatering night and disappear into the warmth of Brazil. We are thrilled to have the brilliant Rio con Brio, as our featured musical guests. This accomplished duo will sweep you away to the spicy streets of the southern hemisphere with their fresh take on traditional choro music. Hailing from Portland, Or, Rio con Brio is comprised of virtuoso mandolinist Tim Connell, and jazz string player Mike Burdette. Blending samba, bossa nova and Brazilian styles this duo packs a wonderful wallop. In the spirit of Mardi Gras, Serenade is throwing a party! Join us and get messy for a crawdad boil. Shake off that winter slumber and wiggle around to the funky sounds of second line boogie played live. Chefs Mona, Jaret and Joe of Tournant will be whipping up a three-course feast of cajun classics. Devour NOLA style bites before diving hands first into tables covered in crawdads. We hope you are ready to get your hands dirty! Enjoy the flow of the evening and dance your way around Tournant to the musical rumpus of Trashcan Joe . Performing on instruments made from recycled objects, they blend vocal harmonies to create a unique sound reminiscent of 1920’s style jazz and blues. The five-piece is made up of a Trashcanjo (banjo made from a trashcan), cornet, accordion, washboard and upright tub bass. Let this jazzy ensemble whisk you away to Bourbon Street in their acoustic time machine. Come celebrate Mardi Gras with our unique PNW blend of crawfish, jazz, gumbo, and blues! Laissez les bon temps roulez. Cozy up with Serenade for a warm and hearty evening that will delight all your senses. On December 3rd, Portland meets the Alsatian region of France for a night of feasting, live music and local wine. Tournant pays tribute to the culinary stylings of the region with their take on Choucroûte Garnie. Heaping platters of smoked meats, sauerkraut and potatoes will keep your hands busy and your belly happy. As you work your way through our three French courses, you’ll be serenaded by Odell Fox, an Americana folk group from Austin, Texas. Odell Fox is a triple threat trio of harmonies, songwriting and instrumental talent, comprised of Jenner Fox, Raphael Shapiro and Hans Bilger. While their music is not Alsatian, Raphael just so happens to be a descendent of the Alsatian region, though he too may struggle to pronounce Choucroûte Garnie. Serenade your senses on September 30 with a communal meal paired with live music and local wine. 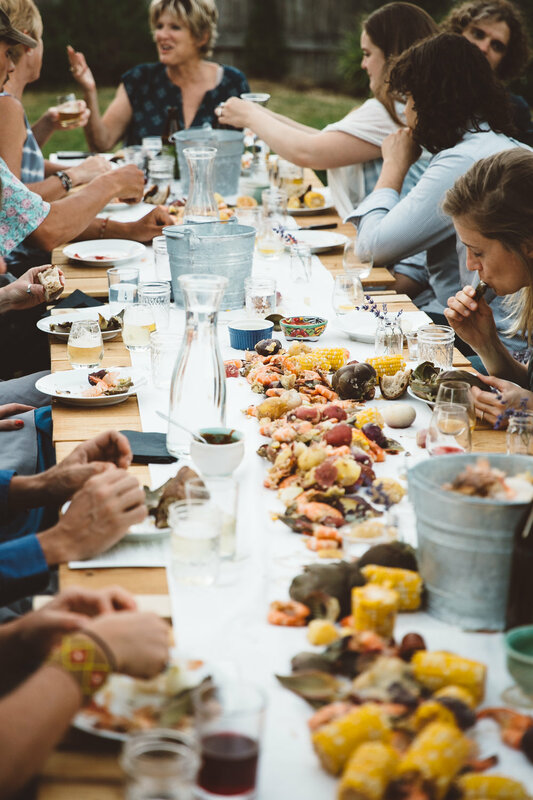 Join us for heaping piles of fresh shellfish, sausage and veggies, as the “Low Country” meets the Pacific Northwest in the first collaborative event between Tournant and Serenade. Savannah, GA native, Austin Quattlebaum, will set the mood with his banjo tunes and soulful southern voice. Chefs Mona and Jaret will draw from the rich bounty of the PNW to create a new twist on this coastal Georgia classic feast. This is not your grandpappy’s typical Low Country Boil, though he'd enjoy it all the same. Don’t be afraid to get your hands dirty! Traditionally, Low Country Boil is dumped onto tables where friends and family gather to eat and drink. No place settings will be harmed in the enjoyment of this meal. We look forward to gathering around the table with you!